These are the first photos sent to me from our class at Sauder Village with Jule Marie Smith, this summer. Bev started the first two in class. She really had them almost finished before we left! This is Hannah's Hen ~ they are all three from the Woolley Fox ~ Bev did a wonderful job using neutrals ~ something I find pretty challenging! 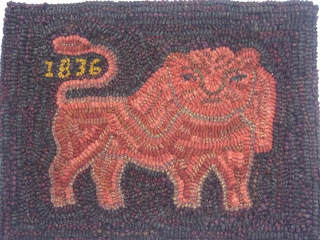 "The Weaver's Lion" is an Edyth O'neill design ~ back in 'olden times', the craftsmen of the day used symbols as their signage and on Edyth's blog "My Red Cape", she explains the history behind this little rug design. 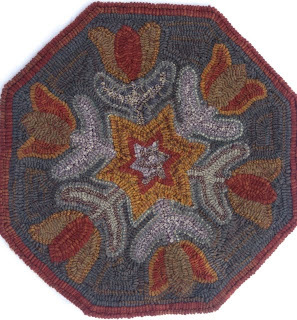 Bev didn't do this rug in class, but included it with her email ~ it is Dutch Tulips, designed by Lisa Baughman, who works at the Woolley Fox! All three of Bev's rugs have great color ~ she had several rugs in the Sauder rug show. Thanks for sending them along, Bev ~ tell your girlfriends they, too, can be 'published' whenever they're ready!!! Yesterday, I put the dye pots on again! This is a nice old red but maybe it does show a little more winey than it is in person ~ but very nice. This forest green came out with lots of nice mottling ~ it will hook up great with it's own natural shading. I'm going to do a batch this morning ~ better get to it, hm? A shopper from the Malabar show sent some samples of things she would like, so I'm getting together a little potpourri to show her!! Yesterday, the old guy went fishing on Lake Erie ~ a friend of our boys chartered a headboat out of Vermillion and had some room, so Sonny, Brian and Ted went along! They actually caught fish!!!! Very nice perch ~ we have three suppers worth in the freezer now! Yippee!! We're off to the lake for our last Fall weekend ~ have to put the patio furniture away and get ready for winter! We do go up all winter ~ there's really just that one little chore to attend to! 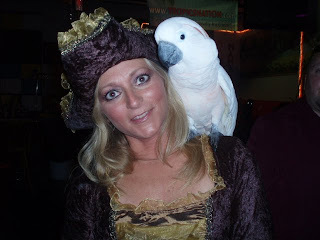 Then Saturday, we're off to Kelley's Island for Halloween hilarity!! People wear the greatest costumes ~ some very inventive ~ some just plain outrageous ~ we don't wear any ~ costume that is!! I do have my nice witch hat with boa feathers but that's the extent of it!! I'll make a report next week!!! Hope there's big fun on your weekend schedule ~ if not, make some for yourself!! Look at the great work these gals did on Thursday!! I love that they expounded on the bones of my design and created these wonderful purse fronts! And they got so much done ~ my classes are from 10-4 with time out for lunch and a look around our house and rugs I have done ~ and other than that, we worked like demons to get as much done as possible!! Look how hard they're working! I had several wools pulled for the purse itself for them to choose from and then let them pull from my wool stash and scrap baskets to build their designs. I put out various rovings and yarns and we needle felted by hand and with the needlefelting machine and had a ball!!!! For the most part, they finished their designs and then had to do the purse construction and lining on their own at home!! Fortunately, all the girls know how to sew!! That's a good thing!! Last night, Penny emailed me her finished purse!!! She went right home and got to work and look what a nice job she did!! I love seeing the results of something that I was able to help with and inspire!!! This is Penny's purse back ~ out of an extra piece of wool, she created a flap that goes to the back so that it doesn't obscure the front design. A couple of the gals requested a zipper closure and a couple chose not to go that route. I favor a loop and button on the back but Penny's version is a good choice!! Thanks for the pictures! And you'll see Pam's, Joan's and Susan's on here as soon as they're done! We did have a fun, productive day ~ for lunch, I made them comfort food!! Homemade macaroni and cheese (it really was good ~ they asked for recipe! ), seven layer salad and homemade bumbleberry pie!!!! So for those of you, who are close enough, if you would like a class on my purse design, give me a call and we'll set one up for you and your friends!!! I think you'll have a good time!!! Saturday, we went to a clambake/surprise birthday party for two of our lake friends ~ Carol and Bill!! We are so happy that soon somebody in that group will be in the 60's along with us ~ finally!!! Their son and daughter hosted it at her son's beautiful home and they were definitely surprised!! Sunday, I went to a birthday party for an 89 year old friend ~ she, too, was surprised! Violet is a lovely lady and I was honored to be included in the guest list!! Yesterday, was a great day with old school friends, Karen and John! Karen is back in our home area from Oregon and our friend, John, drove Miss Daisy down here to the gravel pit (on our property is an old gravel pit!) for the day!!! We laughed, we reminisced, went out to lunch (Sonny joined us ~ that tells you how busy he is! ), we talked politics and the really fun thing is ~ Karen and I signed John up for Facebook!! The picture of us taken with my camera was a bit fuzzy ~ I think the photographer was nervous ~ so Karen will email me hers when she gets home!! Of course, my mind thinks you want to see pictures of old people!!!!!!!! Weather in Ohio has finally warmed up and no doubt, this is our Indian Summer ~ I sure hope it lasts for a while! Tomorrow, some friends and I are going to the lake for a fun day and Saturday is our trip to Kelley's Island for the annual Halloween celebration!!! We need good weather to get on that ferry and do our Halloween pub crawl!!! I hope you're having a good Fall season ~ and enjoying life!! Thanks for stopping by ~ I really appreciate knowing that there are interested souls out there reading this stuff!! Today, the hit counter should mark 28,000 hits since it was installed in January!!! That is pretty amazing to me!!! Again, thank you! preheat oven to 350 degrees. and butter a 1 1/2 qt. baking dish. cook macaroni in boiling salted water just till tender and drain. in large saucepan, melt 4 T. butter, whisk in the flour, and add milk. stir until it thickens, add the cheddar and stir until it melts. add Velveeta but do not allow it to melt completely. mix the macaroni into the sauce and place all in baking dish. cover with Progresso bread crumbs mixed w/ the last T. of butter. bake for 20 - 25 minutes until brown and bubbly. serves 4 to 6. NOTE: I didn't use the salt and pepper and thought it was salty enough. hope you like it!!! Actually, I haven't been gone ~ I've just been a lazy blogger!!! 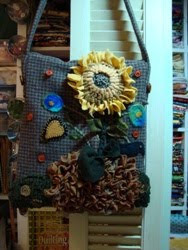 Not much has been going on ~ except this purse front ~ I have a class tomorrow morning ~ here ~ and have been trying to come up with a design. So here it is!! It needs more embellishment, me thinks, but considering I just started it last night, I'm doing pretty good!! The gals wanted some different techniques so I've incorporated french knots, a chain stitch, cat's paw, needle felting, applique along with hooking!! We'll see how they like it ~ I'll be sure to let you know!! Last weekend, Sonny and I went to Prairie Peddler ~ a show that I did for years and haven't been in for quite a while now. It was fun to go back and see a few old friends who still do the show and just wander thru the woods sampling funnel cakes and blooming onions!! That was the really fun part!! I don't miss that show a bit ~ I was so happy to feel that way!! It's a two weekend show in the woods and the weather for the past two weeks has been horrible here in Ohio ~ cold, damp, rainy ~ yuk!! I was feeling pretty smart for giving up that show!! So, now I must call it a night ~ I'm fixing lunch for the gals so I need to be up early to put a pie in the oven and make them some comfort food!!! Pictures to follow!!! Ta ta for now! That's the name Heather Ritchie has given her special event that is happening November 21st!! You can check it out here and for those of you close enough to attend, I'm going to host a Rug Rave event here at my home studio!! Over three years ago, all of us in this photo (Jule Marie, myself, Heather, Heidi and Peggy) went to England to hook with Heather ~ this photo was taken at Sauder Village in August. Heather gave a presentation to all in attendance at the rug retreat, on the work she does in Gambia with the blind and told us she wants people all over the world hooking on November 21 for her Rug Rave ~ and it's her birthday! I told her that I would love to host an event for her and that we would have a birthday party for her, even if she can't be here!! Heather Ritchie is a wonderfully generous and kind person and there are those in our area who would like to support her helping these people to learn a craft and help themselves. So on that day, I invite you to come hook for the day ~ we'll begin at 10 a.m. and end around 4 in the afternoon ~ bring a covered dish to share (we have to eat!) ~ I'll furnish beverages and tableware and a nice winter soup ~ and we'll make a group donation to help Heather further her work with those learning to help themselves! 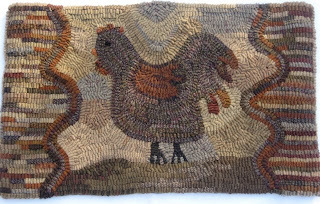 You can bring whatever project you're working on or Heather's Rug Aid pattern can be ordered through Rug Art Supply who has kindly offered to distribute the pattern here in this country, and donate half the proceeds to Heather's fund. I would like you to email your reservation to me at gfraizer@neo.rr.com so I know how many to expect ~ we'll have fun hooking together and honoring our friend, Heather!! Here's hoping we have a full house! Heather's rug was on display in the rug show at Sauder Village ~ she hooked it from a photo taken of her and I believe it was her Christmas card last year! The proddy rug in the group photo is also one of hers and they were both just exceptional. Heather's rugs have a story behind them ~ all part of her daily life and things that mean something to her. We just enjoyed our time with her so much and I'm happy to help her cause ~ I hope you will be, too! This has been a busy couple of weeks! After two weekends of shows, there was so much office work waiting and I actually have made headway on clearing my desks ~ I think I may be getting a handle on this sea of paper that I wallow in every day!! And there was another great grandchild born the end of September ~ Braxton Michael ~ our family is growing by leaps and bounds!! We had a fun Saturday at Kelley's Island with all our lake friends ~ the weather was cold and rainy when we started out but later in the day, we were able to put our bumbershoots away!!!! Our island friends, Janet and Tom, met us at the ferry with golf carts and chauffeured us from pub to pub and to their lakefront home! We had great fun and lots of laughs and some great German food at the Oktoberfest at one of the local establishments!! It was good to get back in the swing of things ~ we've missed hanging out with our friends!! Summer went by so fast ~ here we are talking about Halloween and Thanksgiving plans ~ time flies when you're having fun!!! I hope you're all having some Fall fun ~ tomorrow I need to get some outside decorating done. I have the pumpkins and picked up a couple of mum plants this weekend but definitely need more ~ and a stop at the the 'funky pumpkin' patch is in order ~ these people grow the most unique pumpkins ~ hope they saved some for us! !